On our recent trip to Paris, one of the items on my To Do list was to take a river cruise on the Seine. For a change I didn't plan every detail and activity of our trip and didn't know what type of River cruise to do. So Warren went to the Concierge at our hotel and he recommended doing a dinner river cruise along the Seine but gave us a few options as well. 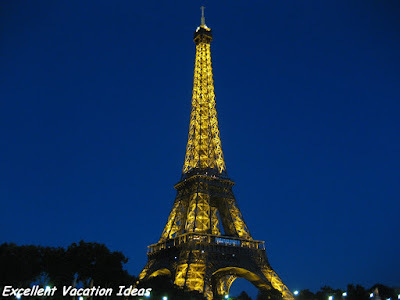 We could enjoy a 4 course gourmet French meal while taking a two hour dinner cruise on a boat like La Marina de Paris, Have lunch at the Eiffel tower and then the Seine River Cruise, or do a bike tour with a Seine River Cruise. 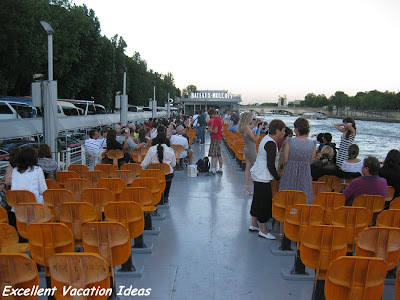 The only thing I knew for sure, was that I wanted to do the river cruise at sunset as I wanted to see Paris on the Seine by day and by night. 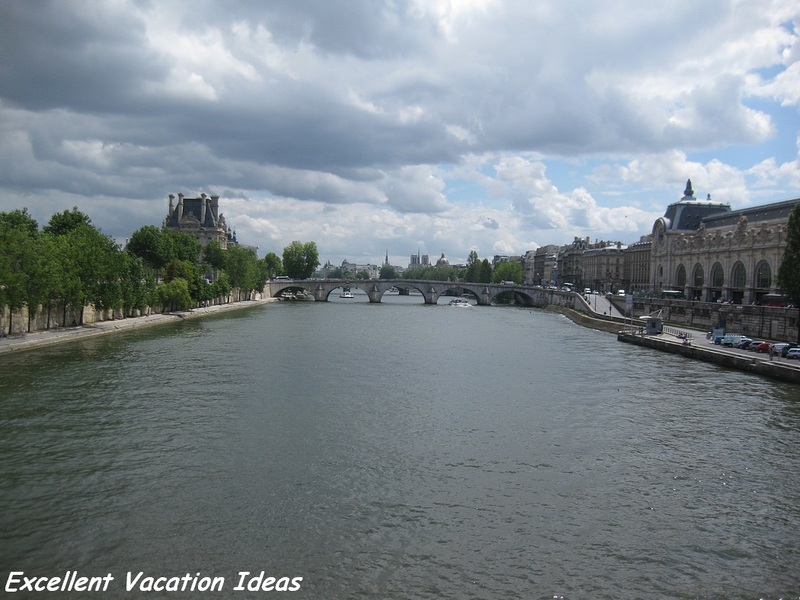 After some discussion, we realized that we just wanted to do a Seine river cruise, with no other options attached. The Concierge said, that was the easiest and the cheapest option of all then. 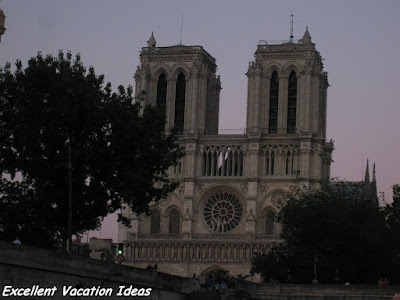 Sunset is around 9 pm just go to the Bateaux Mouches down by the Eiffel Tower. In High season boat tours go every 20 minutes from 7 pm to 11 pm. We jumped on the 8:30 tour. It cost 10 Euros (children are only 5 Euros or free if they are younger than 4) each and was totally worth the money. The commentary is a playback and it plays back in French, English, and German (and possibly Japanese). Sometimes it was hard to hear, but that was ok, we just wanted to experience the city from the Seine. The boat was massive and could hold 100's of people. We were shocked when we saw how many people it could hold. This Seine River Cruise travels past all of the big landmarks on the Seine. In fact it was the only time we saw Notre Dame as we never made it over there in the short 3 days we were there. We also went under the kissing bridge as I wrote about in our Romantic things to do in Paris page. It was a great time and a lot of fun. We ended back at the Eiffel Tower and enjoyed it all lit up. We then had a romantic walk along the Seine back to our hotel and watched the light show put on by the Eiffel Tower each night. Another option that I wish I had seen before going to Paris was the Paris Pass. It includes entry to over 60 attractions in Paris, free use of public transport, hop on hop off bus tour, Skip the line access at the Lourve the Museum d'Orsay and many others, a free map of Paris and a free Bateau Parisiens Seine River Cruise. For a night to remember, cruise along the river Seine, pass under the many bridges and admire the architecture of the historical buildings. 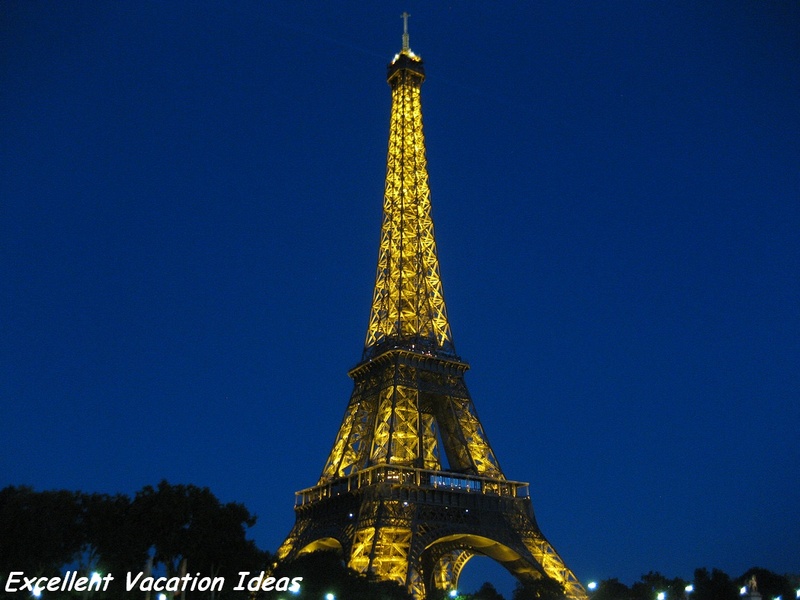 Soak up the wonderful Parisian atmosphere and admire the monuments all around you. Paris looks simply stunning at night time, come and see for yourself!